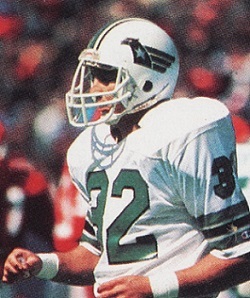 With his great speed and jumping ability, Cifers excelled in track & field as well as football in college, where he was a single-wing tailback and also an excellent punter. 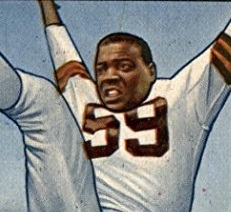 He entered the military during World War II and played service football before joining the Lions, who had chosen him in the second round of the 1944 NFL draft. Lions went 1-10 to finish fifth in the NFL Western Division while ranking at the bottom of the league in fewest yards generated (2146). 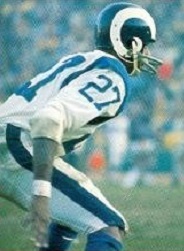 Cifers was traded to Pittsburgh as part of the deal for star tailback Bill Dudley. As a halfback on offense, he rushed for 356 yards in 1947 and 361 in ’48 and as a punter averaged 41.1 and 39.6 yards, respectively. 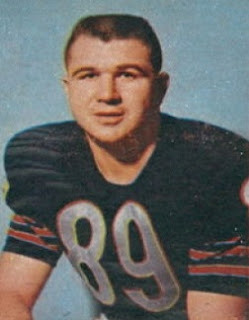 He spent 1949 with Green Bay, his last season. Overall, Cifers rushed for 787 yards on 230 carries (3.4 avg. ), caught 12 passes for 296 yards, and averaged 41.4 yards on 161 punts. His 61.75-yard average on four punts against the Bears in 1946 remains the NFL single-game record to date. His older brother Ed also played in the NFL with the Redskins and Bears. The Tampa Bay Bandits were trying to keep their flickering playoff hopes alive in the United States Football League’s first season as they faced the Denver Gold on June 27, 1983. 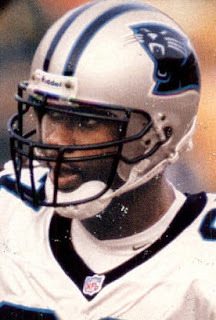 Coached by the offense-minded Steve Spurrier, the Bandits had broken out to a 4-0 start with 33-year-old veteran QB John Reaves throwing to a fine corps of receivers led by WR Eric Truvillion (pictured above). However, Reaves suffered a broken wrist and, while rookie Jimmy Jordan performed capably in his place, he encountered injury problems as well. 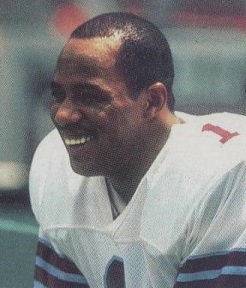 The addition of another talented first-year player, RB Gary Anderson, midway through the season helped, but Tampa Bay had trouble winning consistently down the stretch and was 10-6 and fighting the Chicago Blitz and surging Michigan Panthers for dominance in the tough USFL Central Division. Denver had a 7-9 record in the mediocre Pacific Division. Craig Morton had taken over the coaching reins five weeks before and while the defense was able to keep games close, the offense was unstable at quarterback and prone to turning the ball over. There were 46,128 fans in attendance for the Monday night game at Tampa Stadium. Less than four minutes into the first quarter, Tampa Bay NT Fred Nordgren intercepted a screen pass by QB Craig Penrose and returned it 23 yards for a touchdown. LB Mike Goedecker ran for a two-point conversion to stake the Bandits to an early 8-0 lead. Following a three-and-out series by the Gold, the home team moved methodically to a score on offense. John Reaves, making his first appearance since his injury, completed passes to Eric Truvillion down the middle for 23 yards and to TE Lewis Gilbert along the sideline for 22. 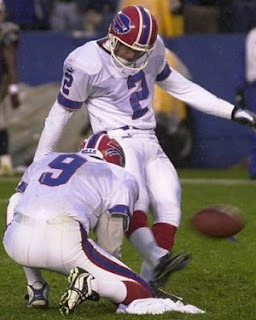 Following a defensive pass interference penalty, the possession concluded with Gary Anderson running two yards for a TD and Zenon Andrusyshyn kicking the extra point that made it 15-0. Early in the second quarter, the Gold finally got on the board as the result of a 13-play, 65-yard series kept alive when LB Putt Choate took off for 31 yards on a fake punt. After five consecutive running plays, Penrose, facing fourth down, tossed a two-yard touchdown pass to TE Bob Niziolek. Brian Speelman added the point after. On Denver’s next possession, the visitors again put together a long drive as they advanced 69 yards in 13 plays. 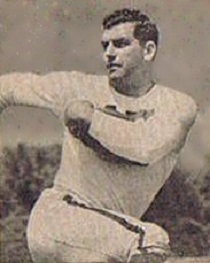 While they lost Penrose to a hip pointer, backup QB Fred Mortensen’s first pass was good for a 24-yard gain that set up a touchdown on RB Harry Sydney’s one-yard plunge for a TD. The try for a two-point conversion failed but the Gold was only two points down at 15-13 with 7:18 remaining in the first half. 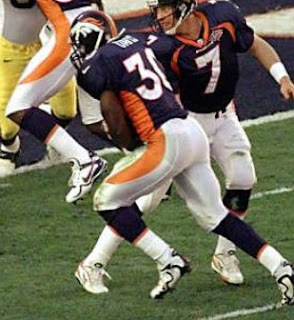 That was it until, after CB David Martin of the Gold intercepted a pass at the Tampa Bay 45 with just under a minute remaining, Speelman kicked a 41-yard field goal with 17 seconds left on the clock and Denver took a 16-15 lead into halftime. 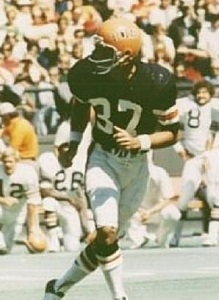 Jimmy Jordan replaced Reaves at quarterback for the Bandits in the third quarter, but his first pass was picked off and the Gold took advantage, moving 44 yards to another scoring carry by Sydney, this time covering two yards. With Speelman’s conversion, the visitors were up by 23-15. At just under two minutes into the fourth quarter, the Bandits put points on the board, this time on a 47-yard Andrusyshyn field goal that made it a 23-18 contest. Tampa Bay had the ball again when a storm erupted with heavy rain and lightning, forcing a 50-minute delay in the action with 8:31 left in regulation. On the second play after the game resumed, Jordan threw to Truvillion for a 44-yard touchdown. Up by a point, the home team got two more when RB Greg Boone ran for the conversion. 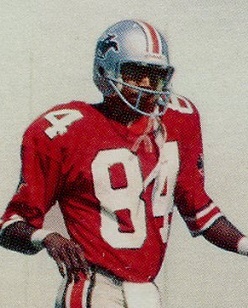 There was still plenty of time, but Denver turned the ball over on its next series when RB Larry Canada fumbled and CB Jeff George recovered for the Bandits. It was also George who finally put the game away with an interception of a Mortensen pass , to the joy of the remaining Tampa Bay faithful in the stands. The Bandits came away with a 26-23 win. Tampa Bay had the edge in total yards (283 to 263) while the Gold led in time of possession (35:37 to 24:23) and first downs were even at 16 apiece. Denver was hurt by five turnovers, with the two late ones preventing a fourth quarter comeback, and was penalized 9 times at a cost of 79 yards. The Bandits turned the ball over three times and drew five flags for 55 yards. In his return to action, John Reaves completed 7 of 13 passes for 72 yards and gave up two interceptions. Jimmy Jordan was 9 of 12 for 131 yards in relief, with a touchdown as well as an interception. Gary Anderson led the Bandits in rushing with 48 yards on 15 carries that included a TD and also caught 5 passes for 36 yards. Eric Truvillion gained 94 yards on his three pass receptions that included the game-winning touchdown. 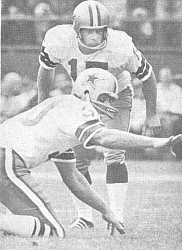 For the Gold, Craig Penrose was successful on 7 of 11 throws for just 28 yards and a TD while being picked off once and Fred Mortensen made good on 8 of 14 passes for 81 yards and gave up two interceptions. RB Vincent White led the club with 72 yards on 13 rushing attempts while Larry Canada, who ran 8 times for 24 yards, topped the receivers with 6 receptions for 56 yards. On defense, David Martin intercepted three passes but was also beaten for the game-winning touchdown. The Bandits needed help to reach the playoffs but it was not forthcoming as they lost their season finale and Michigan and Chicago won to claim the division title and wild card spots, respectively. Tampa Bay finished third at 11-7. The Gold also lost in the last week to place third in the Pacific Division with a 7-11 tally.